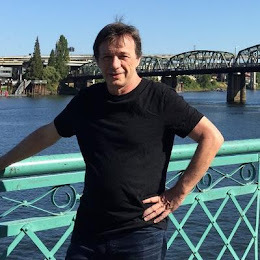 I spent this Memorial Day weekend in Seattle, as beautiful, livable and "feel good" city as I've ever been to and during the breaks from walking everywhere (did not remove the car from the hotel parking once, other then to leave), I read Trading With the Enemy by Nicholas W. Maier. This is a book written by a young member of Jim Cramer's Hedge Fund, Cramer & Company, that Cramer pumps so often on his TV appearances. The fund's returns were about double the returns of the S&P during the nineties, a fact Cramer wears as his badge of credibility whenever he appears on TV. (3) Sweet allocations of hot IPO's in an insanely hot IPO market, again, as payback for huge commissions paid to brokerage companies. If all this is true, we now have an explanation as to why on an equal playing field, Cramer can't trade his way out of a paper bag. Remember, his $400 a year Action Alerts service is barely keeping up with the S&P averages. And his manic TV show, Mad Money, is so scattered and bi-polar in it's advice, stocks are loved or hated on what appears to be whims of host rather then traditonal security analysis. The book also paints Cramer as a foul-mouth Napoleonic tyrant, throwing computer equipment across the room at his employees and blaming anyone except himself for any mistakes that are made in the trading wars. And there were plenty of mistakes made under his commmand. So you probably watch this guy on CNBC, or listen to his radio show or come across some of his written articles in periodicals. Know that his limited success in the nineties came from flipping stocks in a few minutes or hours, seldom for days. 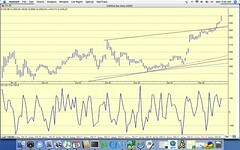 This is the chart I use for my Google Daytrading. I won't go into detail about what it all means, except to say that everything on the screen is there for a purpose and is utilized in my decision-making. I'm not sure how this works, but I think you can click the chart for a larger picture. Monday's strength indicates that the DJIA might well reach into the range of 10800-10900. Today's indication was an upward breakout move from a small flag formation. Such moves normally provide a measured move that will be accomplished in subsequent days. The McClellan Summation Index, which operates at a slower pace than the Oscillator, created a positive variance against the last two DJIA lows; one at the end of April and the other at the end of the second week of May. Then, and this is wonderful news for bulls, the Summation Index created a very fast rise; what is termed a series of upward Breakaway Gaps by analysts who study the Index. The Index itself is almost always regarded as an indicator of Intermediate Trend movements. New Highs/New Lows offer a number of possible indications. I will discuss only two major ones at this time. First, the number of new lows outnumbered the new highs in mid-March and again in mid-April. This was a bearish indication. However, new highs then began to outnumber new lows; a positive indication which has continued. Secondly, as the DJIA made three successive lows in the range of 6950, the number of new lows diminished in each of the three occasions. Once again, this is a positive variance that usually points to higher market prices. The Bond Yield Curve has been inclining upward (I suspect that is a redundant use of two words with a single meaning.) An inclining Yield Curve is almost always a positive indication for the general stock market indices. I use it as a validation of my synopsis of other indicators, not as an indicator itself. I actually review over 40 indicators each week or two; sometimes only monthly. Many of the individually named indicators are developed for each of the market indices, DJIA, NYSE, SP500, NASDAQ and others derived from those indices, such as the SP400 and SP600, etc. This makes a total of well over 100 indicators to peruse. No single indicator ever gives methodical valid signals. There is, however, a body of work that was defined by a market analyst of great merit. I refer to the late George Lindsay. Unfortunately he did not write much about his methods but those methods about which he did write are incredibly valuable. In my work I find that his deliniations of patterns for major market tops are almost magical. Patterns of major market bottoms vary more greatly, but his work regarding bottoms is also extremely valuable. Google is having another good day. I bought a trading position (day-trade only) this morning with Google up 6 points already, call me crazy, but buying strength in this stock has worked every time. I consider myself a successful trader, a consideration that has been very, very hard to come by. There were years when I considered myself successful, but it was a delusion. As described in my profile, I was buying stock in the greatest bull market of all time, it had nothing to do with skill, it was dumb luck. Maybe that's why I am so hard on a guy like Jim Cramer, who couldn't trade his way out of a paper bag, but was lucky enough to be in the hedge fund business at the time of the same bull market and likens his success to skill now, wallowing in his own delusional egomania. Yea, sure Jim, you're the greatest. The greatest, "what" we will leave to your viewers, but moron comes to my mind. Getting back to my rumination on success, I was walking through a Barnes & Noble bookstore today, the bricks and mortar kind inside a mall and filled with educated types, at least more educated then the hordes at the food court across the way. As is my want in these situations, I found my way to the financial sections, investing books in particular. A glance at the book-filled shelves and a couple of smack-in-the-face realizations immediately came over me that I want to share here. First, there was Cramer again, all over the place, his hard cover "Jim Cramer's Real Money: Sane Investing in an Insane World." Sanity is not Cramer's forte, believe me. Flipping through his book, I was taken by how little substance he can put into so many words. Case in point, his "25 Rules of Investing." Number 1, Bulls, bears make money, pigs get slaughtered." What the hell is that supposed to mean? Take quick profits, leave the home run trades for someone else? Have so little faith in your ideas that you cut out on them as soon as there is a glimmer of success? Or how about this gem: "Beware of Wall Street Hype." Thanks Jim, didn't think of that one. Or "Cash is for winners." Again. What the hell is that suppose to mean? Who cares, let's just make it a rule. Ten minutes of skimming through this book, it appears to be little more then his usual shameless self-promotion. Who among us doesn't know he graduated from Harvard Law, started his career at Goldman Sachs, ran his own hedge fund and has lost eight pounds since some undisclosed point in the recent past? Yet who among us can name five stocks he likes right now? What's it all about Jimmy, is it just for the moment, will it end? My other smack-in-the-face realization came from the slew of new books out on online trading, daytrading, short-term trading and making a living online stock trading with the secrets of pros. Flipping through a half dozen of these enticing titles, a few basic themes emerged. First of all, these books with such hopeful promises in their titles spend most of their time explaining the most basic terms of the trade. Entire chapters are spent explaining how to read stock tables in the newspapers, or listing the various data sources available online. Technical analysis is painstakingly described in most simplistic, yet confusing ways. Examples, all in retrospect, are set out in beautiful charts. This is the antithesis of our friend Cramer's Rule 13, "No Woulda, Coulda Shouldas.." In retrospect, we are all billionaire traders. The title of this blog is, "On Success." So let's get to it. Forget Cramer and his like. Forget the books, as in trading maybe more then anything else, those that can do, those that can't write books with catchy titles. One of my friends and readers of this blog as asked me publicly and privately to describe my system, as though there is one magic formula that turns ordinary traders into trading gods with the click of an icon or entry on a spreadsheet. Success is a process, it's an accumulation of knowledge, of instinct gleaned from years of observation, analysis and real time real money trading. I've taught my techniques to only two other traders, one a fellow who has been collaborating with me for a dozen years, and it only seemed fair, since we both had been struggling together for so long, that I share the technique with him. The other person was a friend who I met on an Internet forum, who was going through some painful, life-altering personal problems at home and she suddenly found herself on her own to make a living yet still have time for her children. Trading allows for that sort of freedom and I wanted her to have a fighting chance. Both these traders continue to trade the technique as their sole source of income and have both helped me fine tune what I already have and have inspired me to expand it's capabilities. But there is nothing magic about what we are doing. It is the result of years of hard work and dedication, focus, perservance and determination. That my readers, is the secret of success, hard work, dedication, focus, perserverance and determination. It comes from within, it is free and it is unique to each one of us. You don't need a moron like Cramer, or a get rich quick promotion from a book, or google click-through ad. Success is an elusive mistress, but not beyond your own capabilities and reach, unless you make it so. And if you have read this far, here is your reward: Take a 3 period CCI and place under a daily or even hourly chart of any stock or index of your choosing. See if you have it in you to make money off of what you see. (2) Average 1% per trade at the rate of 5 trades per day. No compounding with either strategy and all results are net after commissions. Which strategy do you chose? Assuming 250 trading days a year and a starting balance of $10,000, the first choice generates an annual profit of $100,000. The second choice, the daytraders delight, generates an annual profit of $125,000. Too close to compensate for the aggravation of daytrading? Let's alter the assumptions. In a big way. Everything remains the same, except you are not given the gift of the holy grail of trading. Now you have to figure out how to trade successfully for yourself, like the rest of us. Figure out a trading strategy that averages 25%, 40 times a year. Or figure out a trading strategy that averages 1%, five times a day. On a $10 stock, 25% amounts to $2.50. On a $10 stock, 1% amounts to $0.10. Think about it, if you have to figure this stuff out for yourself, and you do, which goal is achievable, and which goal is a dream? "A deception carried out for the sake of publicity." It won't come as a surprise to anyone who is trying to make a buck in the stock market that there is a lot of hype out there seeking to separate us from our money. A few blogs ago, I suggested that readers click on some of the ads atop my blog and see if there is anything worthwhile up there. The first two ads I clicked on were Fred Hager and Jim Cramer. The former advertised that his portfolio was up 150% in 2004. True. But YTD 2005, four of his top picks, EBAY, QCOM, RMBS, and ERES are down a collective 27%. Ouch. As for Slim Jim, his Action Alerts portfolio is down 2.88% YTD, ahead of an S&P which is down 4.93% YTD. Is this a reason to subscribe, to lose less then the market averages? Now I am a subscriber to both services, but not for their long term stock picks. Since both services can move markets at times, or at least individual stocks, it does pay me to be abreast of their alerts. But barely so. Is there something of value here for the individual investor? Hard to say. Hager does a thorough analysis of his stocks and maybe ultimately his long term buy and hold the best of the best philosophy may win out. We'll know in a few years, or by the end of this decade, if you can wait. As for Slim Jim, as I pointed out to a friend recently, he is like driving by a bad car wreck, you know it's gruesome, but you just have to look and then spend the rest of the day kicking yourself for being so senselessly repulsed. Yet the quest goes on and I still recommend clicking away at the Google ads, seeing what's out there and reporting back if anything seems worthwhile. In the meantime, one service that doesn't appear in the ads that I have had some success with, not blindly buying their recommendations but getting leads and ideas from their picks, is BI Research. No hype, just good analysis and a slate of stocks you may not hear about elsewhere. This is a test, do not be alarmed, it is only a test. I downloaded a widget, called "Dash Blog" from apple.com. It sits on my desktop's toolbar and whenever I get the urge to post to my blog, I simply click the widget icon and start typing. Does it work? Are you reading this on my blog? This is all on top of the recent FDA approval of Amylin's two drugs for treatment of Diabetes, Symlin and Exenatide. As I continue my learning tour through the Google 2004 annual report, one recurring theme seems to "pop-up" on my radar again and again. It has to do with this and other blogs, websites and web destinations of every kind and flavor. They all seem to be accompanied by click-through advertising. All sorts of people and companies are offering their goods and services to what may have been a previously untapped community of potential customers, the Internet surfers. The cool part of Google's technology is that they can figure out what the surfer is interested in and hand pick relevent advertising to place on the selected pages for viewing; a simple and elegant way of bringing together customers with merchants. This ignited some curiosity on my part, what kind of advertisers were being placed on this blog? Not surprisingly, the vast majority of advertisers here are in the business of selling stock advice. Systems, picks, courses, newsletters, software, almost anything that might be of interest to traders or investors. This makes sense, as most of these blogs so far have been about trading and investing. But what is even more curious is just what kind and of what quality are these products and services that seem to be "sponsoring" my blog? So recently I have been clicking on these ads and checking out the substance behind the cute promises cullied to get our attention, or more importantly, attract my readers' mouse and index (read: click) finger. Now first off, I am programmed to reject all claims and representations made by anyone selling investing/trading advice. Such wasn't always the case, but as with most who enter the arena of chance that we call the market, I have been seduced many times by promises and track records that more often then not were simply outright fabrications of reality. But here's another perspective: I once ran an S&P timing web site based a neural net that my good friend Joe developed. It worked beautifully for about 20 months, then fell apart never to be pieced together again. But at the beginning, we advertised it on the Internet, just like the ads appearing around my blog today, gave everyone a two month free trial and actually had real testimonials from real traders who made money off of it. You would have been hard pressed to distinguish a real winning trading system from the phony promises by the few words exaulting you to click your way to riches. So you never know, and if anyone, including me, finds anything worthwhile in these products or services, share it with the rest of us, as it appears we are all in this for the same reason, to make money, however it can be made. Speaking about making money...... the past few days have seen a very nice upswing in the number of insider buying filings . Some of the symbols that have most recently popped up are: UTEK, ZHNE, NMSS, INFS, IED, and OSTE. The immediate pops, if any, are over, but as discussed in earlier blogs, under the right conditions more intermediate up moves can sometimes be triggered by these filings. We visited the Google story earlier, citing David Gordon's fine work in bringing this investment to our attention. There are several analytical pieces on David's web site related to Google, the company and the stock. My weekend reading this weekend included probably the most informative material yet on Google and it came right from the horses mouth, the December 31, 2004 Google Annual Report. First off, even though my own blog here is part of the Google network, I never really understood how all of this fit into the Google story until about 1/3 of the way the annual report. Wow, I'm in business with Google! Or should I say, they work for me. Second, I always thought of Google as a search engine, ok, THE search engine. Half-way through the Annual Report, I realized that Google is not only a search tool, Google is the Internet. The more I read about Google, the more I want to own a piece if it, it's not just a company, it's not just a stock, Google is the future with the best yet to come. The very best recommendation I have for you is to download the 2004 Annual Report, if you haven't otherwise already read it, and spend some time reading about this incredible story. Does this guy know stocks, or what? Along with his new CNBC hour of bellowing stock opinions, Cramer runs a subscription stock service through his street.com site, appropriately named, "Jim Cramer's Action Alerts Plus." Ever wonder to yourself just how good he is? Of course, past performance is no guarantee of future performance, which in this case, is probably a good thing. A friend of mine has done some extensive analysis of Google, concluding it to be a, "singular opportunity" and maybe the singular investment opportunity of our era. His name is David Gordon and his web site is worthy of your frequent attention, above and beyond about a half dozen illuminating posts on Google. I personally bought Google before I read David's thoughts on the opportunity it presents, but have since bought a lot more. If you miss the excitement that once was the stock market, picking stocks, trying to see the big picture instead of 5 minute bars, you'll enjoy David's blog. As for me, April is none too soon gone and a fresh month of trading is upon us. 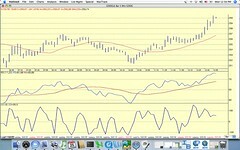 The bullish case has come to a crucial point, at least as Harry Dent see's it and as descibed in my archives. Essentially there's about 300 Dow points of risk here that if taken out calls into question Dent's entire great Bubble Boom hypthesis. Against that risk is a minimum of 6,000 points of upward reward. Not a bad bet, if you are a betting sort, especially with market sentiment near historic lows by some measures. With April earning season behind us and so many stocks wallowing near there 12 month lows, my expectation (read: hope) is that insider buying perks up in May, along with my "old school" day-trading system which I have noted in my previous blog has picked up a bit in the past week or so. It's Sunday night here in the inland Northwest, my Mac's new operating system, "Tiger," is installed (brilliant!) on my Powerbook and I for one would be hard pressed to imagine things (read: life) doing anything but turning up in May. Of course, I've been wrong before.